The Romanian Tolkien Society, in partnership with the University of Bucharest, announces the organisation of its third annual conference: “J.R.R. Tolkien – Sources of Inspiration”. The conference will take place on Saturday, the 22nd of November, 2014, from 10:15 AM at “Casa Universitarilor” in Bucharest, Dionisie Lupu str., no. 46 (map: http://bit.ly/1Ed23SI). The writer and theologian Robert Lazu (Timișoara) will be the keynote speaker for the conference. With his erudite knowledge on the Old Norse and Ancient Greek mythologies, but also on the traditions of Judaism and the Patristic and Medieval Christian culture, Tolkien imbued, in his writings, themes and characters drawing on all these traditional cultural universes. Hierarchically structured around the heroic ideal of sacrificial love, they define the essential scope of the creation of an author who would have felt more at home in the universe of St. Hildegard von Bingen than in the world of mechanic artefacts: the eucatastrophe. Tolkien’s Apocalypse. The Biblical Roots of His Mythopoetic Imaginary. The Romanian Tolkien Society organises this year’s meeting on the eve of the launching of the last and final part of the “Hobbit” film trilogy, and this will inevitably lead us to a discussion of the role and significance of these films in the reception of Tolkien’s work in Romania and throughout the world. The Romanian Tolkien Society was created in 2012, with the purpose of promoting the creation and personality of the British writer, philologist, and university professor John Ronald Reuel Tolkien, particularly for the use of young people in Romania. Each year, the Society brings together both people for whom the Professor’s works have become an academic pursuit in itself and all those interested in meeting and discussing their own ideas on the various aspects of J.R.R. Tolkien’s creation. Media partners: Radio România Cultural, Serial Readers, Cultura review, bookaholic.ro. The working language of the conference will be Romanian (and English if needed). 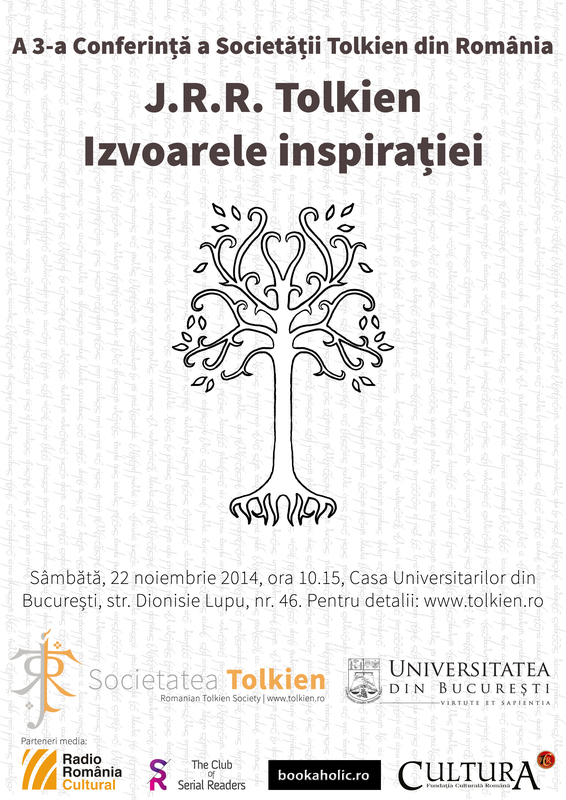 For further details and the conference program, please see: www.tolkien.ro. RSVP at: email [email protected] and tel. (+4)0724 666 334.